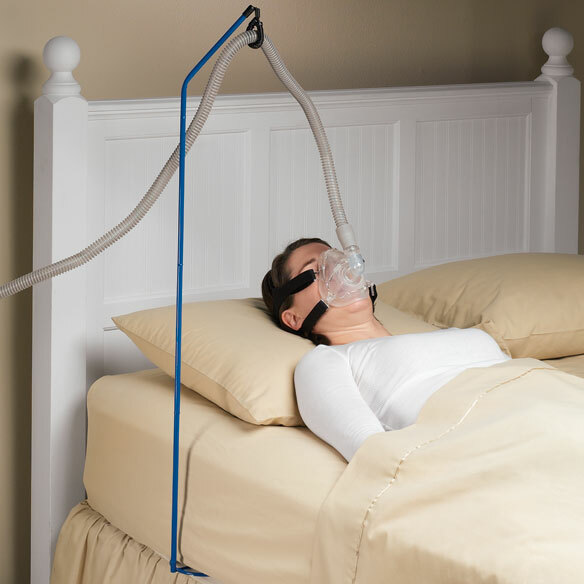 The CPAP hose holder is a sturdy iron pole that secures under mattress and fits any CPAP hose, keeping it up and out of the way as you sleep. Folds for storage. CPAP hose hanger is 34 1/2"H when set up. Fits hoses up to 1 1/4"dia. Very helpful for comfortable sleeping. Got this for my husband when he first got his CPAP. He likes the way it keeps the CPAP hose out of his way getting in and out of bed. It also facilitated turning over from one side to the other. He uses it every night and packed it in his suitcase when we went on vacation. Great addition to the Cpap suppiies. This "stand" keeps the hose completely off of one's body and out of the way. I don't even have to think of moving the hose or stretching it out more. This little "stand" is wonderful. I'm thrilled my sister discovered it for me. i am ordering a second one just in case the company stops making them. I am dependent upon having it to make me much more comfortable using the cpap machine. No more wrestling with CPap tubes! After struggling for 4 years with my cPap tube I was thrilled to find this holder. It keeps the tube up and out of the way but doesn't restrict movement when I turn in bed. It's fantastic. It keeps me from rolling over the hose during the night. The hose is up and out of the way to move around. I've had this CPAP hose holder for at least a couple of years now. It works fine, and when we go on vacation I take it along and it works fine at the hotel too. I don't know how I'd get along without it. Keeps the CPAP hose from getting tangled around my husband. I sleep all night and can turn over without waking up. It does not tangle and keeps the hose organized. As an aid to a prescribed C/Pac machine. This is the second one i have purchased as they break easily. Not a bad product if the base was bigger. This base does not go into the mattress far enough for it to be stable. Had to put it between frame and mattress instead of between box spring and mattress just to get it a little more stable. This is the second one I am ordering for my husband. It works great; makes using a CPAP much more comfortable. No more tangling up in the hose. Only wish it were not so flimsy. It broke, after less than 2 weeks, at the junction of the triangle clip that holds the base to the pole. But it made such a difference in my husband's comfort that I'm ordering another one. I'm hoping my son can figure out a way to reinforce this one to make it a little sturdier. I LIKE THAT IT KEEPS THE HOSE UP OFF THE FLOOR AND AWAY FROM MY FACE. The cost does not equal the quality of the product. The picture nor the discription clearly explains the method for assembly which would convince you not to purchase until the price is drop, considerably. Used it with my CPAP home machine. Fell apart with very little use. Another poorly made product! Works fine awhile, about 3 months, and then metal tubing comes apart in your hands and ring tears and cannot be fixed. You get stuck with the exorbitant purchase price on sale of another lousey All-American product these days. nice idea but made too short to work correctly, may I return it? It fits my husband’s needs. I need this to hold the hose from my Cpap machine in place while I am sleeping, keeps it out of my way as I am a restless sleeper. Have a new A Pap headgear from Dream were and this works better than the one I have. Keep hose out of sleeping way. My husband was always waking up (and me too) during the night to adjust the hose. This is a life saver, no more sleepless nights. I have been looking for a product that would help me with my CPAP problems while I sleep. BECAUSE I HAD ONE AND GAVE IT TO MY DOCTOR. THIS PIECE OF EQUIPMENT IS GREAT AND EASY TO USE. Mostly so the tube is off the floor so my dog doesn't accidentally chew a hole in it. Needed to stop wear and tear on apparatus. To keep the hose from pulling the mask off when coming direct from the cpap machine. This thing is great. You can turn without having to move the hose at the same time. Recommend it for all CPAP users. Works for travel too. HOPEFULLY THIS WILL MAKE MY DREAMS & NITEMARES MORE PLEASURABLE INSTEAD OF THINKING I AM GOING TO CHOKE MYSELF ON MY CPAP HOSE ! It helps me to move around. I have CPAP but don't have hose holder so I needed one. Need second one for travel. Saw this CPAP hose holder and thought the price was right. Will work right as I roll back and forth all night. The item was on sale and it looked like one that was recommended tome. To sleep more comfortably wearing my CPAP. This is a great tool. Both my husband and I have CPAP machines, this makes it SO easy. Stays out of the way, you can turn over at night without waking up to fix the hose. Good Job. Keeps the hose off the bed and out of your covers. I needed it to keep my cpap tubing from falling off bed and pulling off my mask. My husband just got a CPAP. I've been needing something to hold the hose out of the way. I move around a lot at night. BEST ANSWER: Thank you for your question. To checkout follow these steps. I am very happy with it, highly recommend it. Happy with what? The difficulty with using this site? I did't even order this item.